Shimano’s excitingly-named BR-R785 hydraulic road bike disc brakes are a genuine improvement in braking power and control. There are a couple of kinks still to be ironed out and they’re not cheap, but they’re still a compelling upgrade. With SRAM's fancy-pants Red hydraulic brakes still not available following their embarrassing recall, Shimano might well expect to sell quite a few of these, their first hydraulic disc brakes for road. They are only compatible with Di2 electronic shifting - the hydraulic reservoir fits in the space where the mechanical gear-shifting gubbins would be - so the controls look a bit more, well, normal than SRAM's, too. Shimano has launched these brakes as non-series; they don't strictly form part of the Dura Ace or Ultegra groups (although being Di2-specific, they need to be paired with one or the other). We tested them with a 2014 11-speed Ultegra Di2 groupset, which will be reviewed separately - here we are focusing on the brakes themselves. Shimano's road disc brake system has been designed for use with 140mm or 160mm rotors, with the idea being that users can choose the size to suit their weight and intended use. 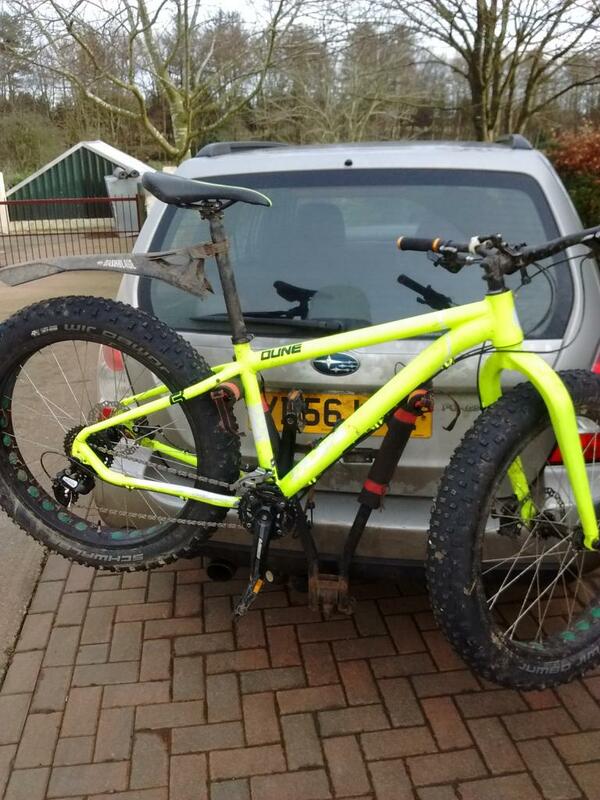 We used 160mm up front and 140mm at the back, simply because this was what suited our test bike. Shimano identified overheating as being of particular concern for discs on the road - longer, faster descents (and smaller rotors) being likely to result in rotors and pads heating up more than off-road. It's good to see them designing specifically to reduce this issue, with cooling fins on the pads and rather pleasing bimetallic rotors. These are made of aluminium sandwiched between steel outer layers and have wavy aluminium sections inboard of the brake track, designed to maximise surface area for improved cooling. Shimano's tests have shown that this helps maintain brake performance better over long descents (aluminium conducts heat significantly better than steel). While most of our testing was done in areas sadly lacking in big mountains, Dave found that they dealt well with coming down Mount Etna at the launch. The bimetallic rotors are only available in Shimano's Centerlock design, and so due to hub compatibility issues we also ran the brakes with conventional rotors (from Tektro Lyra brakes). Pad contact area is a bit less with these rotors, and we felt that this slightly reduced brake performance, which nevertheless was still very good. Increasing numbers of cyclists have now tried mechanical disc brakes on the road, so the benefits of more consistent brake performance in all conditions, longer lasting rims and less tired hands will be familiar to many of you. The major difference that hydraulic brakes give is the absence of friction in the brake lines. I run Avid BB5 mechanical discs on my commuter bike, and when I fit new cables and get everything set up just so, they are excellent. However, once you start to get crap in the cables and the caliper mechanism, performance and feel start to progressively degrade. No such issues here: basically all the force you put on the brake levers arrives undiluted at the brakes as there is effectively almost no friction in the hydraulic lines. This also means that tight bend radii (as are often found with internal cable routing) make no difference at all. The absence of friction has two benefits - it means you have to pull less hard on the levers and it gives you clearer feedback of how hard you're braking. Hydraulic brakes also self-centre and automatically compensate for pad wear, neither of which you get with cables, and both of which are real benefits. Of course, if you get a leak then you can't fix it out on the road with an Allen key, but we had no issues with leaks here (I've only ever had one, on my mountain bike, where a seal sprung a leak in a well-used brake lever). Pulling back the hoods reveals the bleed port as well as two adjuster screws. One at the top adjusts the normal lever position, offering a good range to suit those with larger or smaller hands. Another screw, oddly angled in the side of the lever body, is supposed to adjust "free stroke" - how far you have to pull the lever before the brake pads touch the rotor. This didn't work very well in my experience - the available range started at around 10mm of free travel (at the end of the lever) and went to 20mm or so. Really you'd want to be able to dial this all the way in until the brakes were rubbing and then adjust it out just so, to suit your taste. I tried bleeding the whole system to see if the longer stroke was due to a bit of air in the system. Bleeding the brakes is a simple task, so long as you have the bleed kit; I wouldn't recommend doing it without unless you want mineral oil everywhere. There's a funnel that attaches to the top of the lever, and the system is bled from the caliper; basically you syringe enough oil through to ensure there's no air left. Once that's done there's a plug for the funnel to stop the oil dropping back through the system and out all over your rotor, and remove the syringe, tighten up the caliper port and then replace the bolt on the lever. Getting the lever's rubber hood back on is a tricky affair; I found a small screwdriver was good for poking the locating lugs back into their holes. After all that was done, though, the lever action was the same as before. So Shimano still have a bit of work to do on the system adjustment for the user. If you have small hands and you dial the lever right in with the other adjustment screw, you'll likely be contacting the bars before you're on full power. The calipers are based on those used in Shimano's mountain bike groupsets, so the design and technology is well-proven. Calipers mount the same as mechanical disc brakes would, with the rear fitting either inside the rear triangle or on the seat-stays according to the design of the frame. On our test bike, the rear caliper was inside the rear triangle - I sometimes found that my foot came into contact with it, particularly the screw where the hydraulic line meets the caliper, which protrudes more than ideally it would. In use, the brakes are really excellent, with significant improvement in modulation compared to mechanical rim brakes. Modulation refers to your ability to apply just the right amount of brake force to slow you down as required. As has been observed a million times by disc-brake refuseniks, you don't need more power than you get with a traditional caliper as you can easily lock up a road bike wheel, but in being able to get right up close to the limits in braking grip, uncorrupted by brake line friction or compression, your ability to control the bike is unquestionably improved. The greater mechanical efficiency means your hands and wrists get less tired too - a real benefit when on a long hilly ride or race. 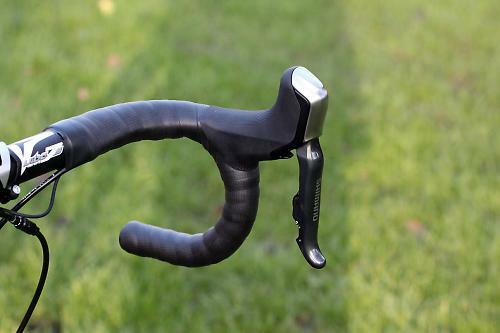 The ergonomics of the controls themselves are essentially identical to the cable-brake Di2 equivalent. They are well-designed for a range of hand-sizes and are pretty comfortable even for long distances. The hoods stand a bit further off the bars than some shifters (SRAM in particular), so you may need to experiment with different shape bars if switching from one to the other. I racked up hundreds of horrible wet dirty commuting miles without directing a hose at the bike, which was almost unrecognisable by the end. Throughout, the brakes operated reliably and with no reduction in power or control. (Similarly the Di2 gears didn't put a foot wrong, even having been through a couple of floods). When commuting, this dependability is a key benefit. Perhaps it will not be until Di2 and hydraulic discs are available with Shimano's 105 groupset (or hydraulic discs get their own mechanical shift lever) that this will be a common set-up for all but the very best-heeled commuters, but if you can afford it I would certainly recommend it. On longer rides at the weekends, I had the confidence to go faster on twisty downhills, knowing that I could accurately apply enough braking to slow down without locking a wheel. As I mentioned, I run BB5 discs on my commuter and these hydraulics are streets ahead in every respect. I haven't yet tried SRAM's Red hydraulic discs, and because they've been recalled no-one on the road.cc team has really put enough time on them to make a fair comparison, so that will have to wait. As things stand, you can't enter a road race with disc brakes (even amateur regional races typically adhere to the UCI regulations on such things), but maybe things will change there. The current objections centre around the theory that a peloton including some riders on disc brakes would be less safe, due to the variation in brake performance. This is manifestly nonsense - every rider in the peloton could lock up his wheels, and those with hydraulic discs would be less likely to do so, not more. 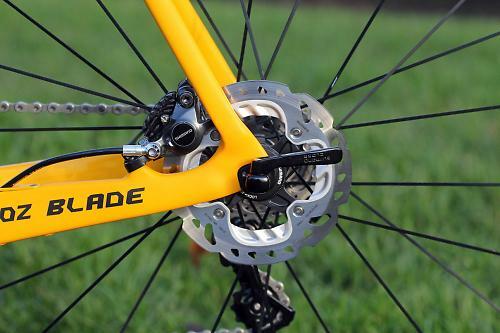 Hydraulic disc brakes perform better than either rim brakes or mechanical discs in just about every respect. Aside from the significant cost (particularly as Shimano's are only available with Di2) the only downside is the additional weight, but I'd argue that for the vast majority of riders this is a price well worth paying. The weight, I mean. The price itself, well, it is a lot. I'd struggle to justify it, but over time the tech will inevitably trickle down until it's within the reach of the rest of us. If you race, you'll have to wait until the UCI give the okay, but for everyone else, if you can afford it, these brakes are very much recommended. They're not without their glitches, but they outperform rim brakes in pretty much every situation. Very good first incarnation of road hydraulic from Shimano; better will surely follow. Designed for all day riding comfort, durable and dependable performance. The new BR-R785 hydraulic disc brake caliper features a two-piston design with mountain bike stopping power that is tuned for road use. Heat reduction in the caliper is further enhanced with ICE Technologies finned disc brake pads that reduce heat by 50 degrees. New SM-RT99 Center-Lock finned disc brake rotors further reduce heat in the braking system by 150 degrees compared to steel disc rotors creating a system advantage with the BR-R785 ICE Technologies enabled disc brake caliper. The new SM-RT99 disc rotors are available in 140mm and 160mm sizes, allowing road riders to custom tune the braking performance according to ride conditions, terrain, and rider size. Di2 / hydraulic dual-controls are well-built as you'd expect - on a par with Shimano's standard Ultegra controls. Shimano's calipers are proven in the mountain-biking world, so I would have no concerns about their coping with road use. A huge step forward. Almost the only thing keeping it from a perfect 5 stars for performance is the insufficient free-stroke adjustment. It's all solidly built and I'd expect the main bits to last well. The bimetallic rotors will probably not last as long as solid steel ones. Not yet on a par with rim brakes, unsurprisingly. Dual-control levers are well-designed and suit a broad range of hand sizes. Hands get less tired than with traditional brakes. Yeah, they're quite expensive at the moment, aren't they? Very well indeed - hydraulic discs bring a real transparency to your braking - you can feel exactly how much force you're applying and this gives greater confidence and ultimately higher speed. Zero friction brake-lines, reliable modulation. Free-stroke adjustment is essentially useless in this setup. Would you consider buying the product? When it trickles down a tier or so. I've been riding the R785 setup for a couple of months now and love them. After years of riding MTB with disc brakes it was an easy choice to try these out and I don't regret it at all. Braking is consistent, reliable and instantly there when you need it. I've also re-bled the rear brake several times to try and get less travel in the lever but I can't. This does make me feel as if I'm missing out on some rear brake power as the lever is almost to the bars under heavy braking. This makes it tricky to use one-finger braking for the rear as the lever easily touches my other fingers... a shame as braking is so easy. Also, those rubber hoods are a right pain to get back in place properly. Mine spend most of their time without the grommets in place, not a problem when riding but it does look a bit untidy. Running 140mm discs front and rear, centerlock. My weight 70kg and braking is fine. No disc squeal or other noises when riding/braking. If you have a chance to try these...do as they are great to use. You could wait a year to buy till the small niggles are ironed out but they are minor and life's too short. Has there been any talk from the big companies ain't experimenting with ceramic brake discs? If Shimano are concerned with brake fade I'd be surprised if they haven't started looking into it by now. I am a bit meh about discs on road bikes, I accept it will happen, but if they don't do hydro's for non Di2/EPS (I won't touch SRAM with a bargepole so don't go there) I am really not interested at all. For background I have XTR discs on the MTB so know what they can offer. IMO going to cable discs you loose so many of the benefits of discs, to the point personally i'd just stay on rim brakes. Big problem I can see is going to be cost. no road shifters are particularly cheap, decent MTB disc brakes aren't particularly cheap either, add the two together and you potentially have very expensive brake levers just waiting to be crashed. The brake levers should 't be going to the bars Stefan, at least the brakes on my current test bike don't. I'd suggest you might need to bleed them again, it sounds like you might have let some air in the system, which can happen. Does the brake lever also feel spongey? I really rate my TRP HY RD. Really really good feel and excellent modulation. And so easy to setup. Basically follow the instructions. Then loosen the cable bolt and slightly move the arm upwards. You then get brilliant feel and very little lever throw. Was expecting a raft of the usual Luddite 'I remember when this was all green fields' responses to this one so quite heartened by the reasoned debate above. Having ridden road bikes with disc brakes in all weathers, I can totally see the advantages in our damp little islands. I suspect the people who moan about them are the same types who probably moaned about the advent of clipless pedals and the disappearance of downtube shifters too. 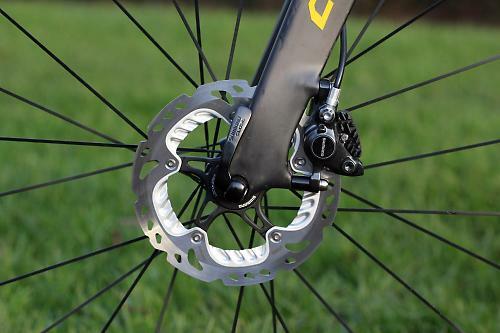 Not that I suspect consumer opinions really matter - if it enables Shimano, Specialized and Mavic to sell a whole new generation of expensive kit, I suspect disc brakes will just become the new norm whether we like it or not. Me too! I ride a few bikes: an old MTB with v-brakes, a road bike with calipers, a cargo bike with hydraulic discs and, more occasionally, a tandem with cable discs. All are decent versions of their kind, but the hydraulic discs are streets ahead of the others. I'd have them on all my bikes in a heartbeat if cost wasn't an issue. Not planning to replace my road bike any time soon, but when I do I'm sure it'll have electronic shifting and hydraulic discs. To be honest I'd see the ability to fit hydraulics as being as much of a driver for going electronic as the improvement in shifting. I'm not going to buy these (maybe if they were 40% of the price I could afford them), but thanks for conducting and writing such a rigorous review. Fantastic bike journalism. I was going to try one more time as the rear has already been re-bled 3 times then I 'm going to have to get them back for checking... not a good ad given my praise for the system! rotors and pads heating up more than off-road. It's good to see them designing specifically to reduce this issue, with cooling fins on the pads and rather pleasing bimetallic rotors. It's identical to Shimano's MTB brakes. Not sure how they are designed specifically for the road heat issue. Surely bigger diameter rotors would aid cooling? presumably. however, because of the construction and design of the rotor a smaller one wouldn't have as high a thermal capacity, which would mean that the heat migrates more quickly to the cooling fins, where it's dissipated more efficiently. so i'm not sure it's quite as linear a relationship as with a solid rotor. in any case, the cooling with 160/140 and 160/160 setups is sufficiently good that they barely fade at all, even when you're specifically trying to make them. If only they were in stock somewhere (I want them in black). I've got my birthday money burning a hole in my pocket! Can you answer something for me? I understand they self-centre? I presume this would aid wheel changes and prevent rubbing even if the rotor isn't in preceisely the same position on the different wheels? However I've just returned from a generous trial (thanks to the Newcastle's Edinburgh bike shop staff member generously lending us his bike ) of a Genesis with the new cable Hayes CX's..They'd been running all weathers since Oct last year..They were every bit as positive, with great modulation as good as the 2010 Deore hydraulic brakes my Genesis Latitude came with. They're standard equipment on the Croix de fer and are (just) one of the reason's it's such a great bike! I suspect you're wrong, but hey. I have the same issue with the excessive free stroke travel. Just seems like the pads back way too far off the disc and require too much lever movement just to close the gaps before any braking force is applied. 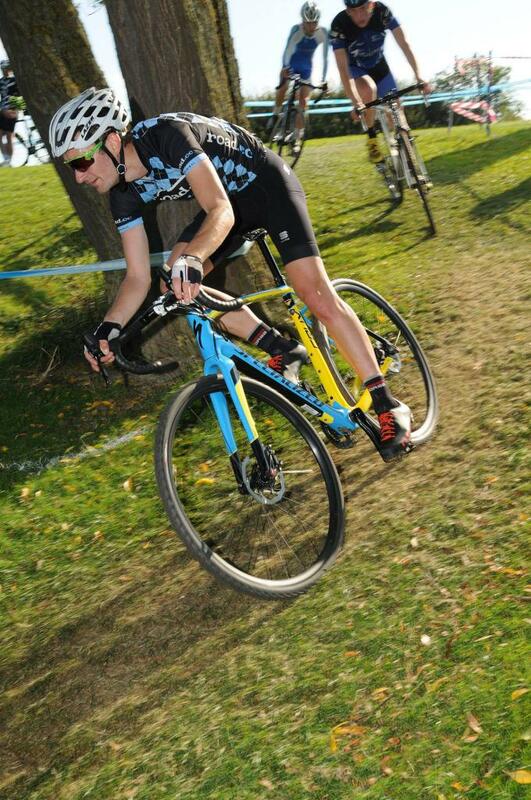 In cyclocross dismounts I have to watch my fingers are not under the lever when approaching a barrier. I noticed that you used Tektro rotors with the R785's. Whats the compatibility on the R785's and R685's? For a 6 bolt hub is it best to use a Ice Tech RT86 rotor? What about SRAM Centrelines?